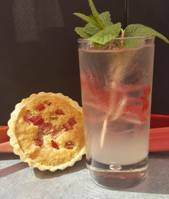 Rhubarb Shrub is something we look forward to making that is a little different. 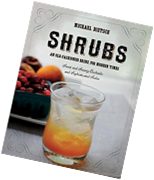 A shrub (other than the kind in the garden) is an old Arabic beverage made with fruit, sugar, and vinegar. Chop the rhubarb, put it into a non-reactive container, pour the sugar over the rhubarb and let the mixture sit for 24 hours to macerate. Drain off and reserve the syrup, also save the sweetened, softened rhubarb for another use – its perfect for a pie or salsa etc. Put the syrup and vinegar back into your non-reactive container and let it sit in the refrigerator for a week. After which it is ready for use. Make a simple soda with a couple ounces of shrub and soda water or get creative and make your favorite vodka cocktail with rhubarb shrub.